You'll be glad to hear that the lack of posts since last Saturday is not a case of post-Salute funk; I simply didn't have anything in particular to show off or write about until today. Largely because I've been busy reading most evenings. However, I haven't been completely idle on the hobby front. I've been prepping some of the figures I'd bought at Salute - the various SYW commanders from Eureka and the Essex grenadiers and dragoons for my SYW Russians. If you're wondering about the grenadiers, they will be for combined grenadier battalions which means that I don't have to paint flags! Today I've spent a bit of time with the airbrush, priming the Sea Peoples army. That took me three sessions and I was worried that I was going to run out of the light grey primer - luckily I had enough in the bottle. Somehow, when I was planning my purchases for the army I slightly miscalculated how many packs I would need. I'd forgotten about the foot command figures so I've actually got more figures than I actually need, although it will allow me to represent the retinue warriors as both heavy foot and medium foot. And do a few extra bases of medium foot javelinmen in case I want to use the army as Philistines. Not much more to report today. I will try to get some painting done this week, but haven't decided what it will be just yet. And then painting will have to take a break for a week or so as my flat will be in chaos - I'm having all my windows replaced. Well, I've been home for a few hours, taken pics of my loot, uploaded and resized all the pics I took, put (most) things away and had a bit of a relax watching TV so I guess it's time to do my Salute post. 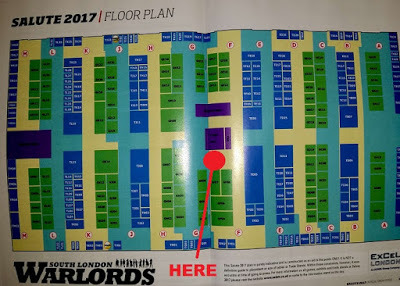 I got into the ExCel centre and joined the queue at about 0950 and finally got into the hall at about 1020. I'm not sure how they did the letting in last year (I was in early on a press pass) but it was so much better two years ago where they let in one rank at a time. This year you had to snake back and forward before finally getting in - I must have walked close to a mile doing that. There seemed to be more open space (and seating areas) this year which is no bad thing. I'm not sure if that was down to a somewhat larger hall or if there were less traders. I think it may have been a combination of the two. I didn't take many pics of games this year. Overall I was less impressed with the games than on previous occasions, but there were a few stunning tables. Of course, there were a couple that I spotted and thought I'd go back and take pics later but managed to forget. There also seemed to be a big increase in the number of small demo game tables associated with companies. At 1pm various bloggers gathered by the painting comp display for the now traditional meetup. There were less of us this year than last, but still a good crowd ad it was nice to catch up with folks in person. I've posted both pics because both cut off someone at opposite ends. In the pic are Legatus, Alastair, Postie, The Wilde Goose, (someone at the back - Dave? ), Big Lee's Padawan, Big Lee, Big Red Bat, moi, Fantorical Simon, (someone), Carl Packham, (someone), Ray/Badger/Sandbagger, Provost Marshall, Michael Awdry, Al. Eric the Shed was also there, but isn't in the pics for some reason. Bob Cordery turned up after the photos had been taken and it was good to finally meet and chat with him. I eventually left at about 3pm and encountered the odd experience of having to queue to get down to the DLR platform. I guess that was down to Customs House station being closed and everybody (not just Salute - there was also the London Marathon registration and a few other shows on) having to use the Prince Regent station. These were actually my final purchase of the day. I decided that I want to try out the Honours of War rules, but didn't want to fork out (and spend months/years painting) another 15mm army for the SYW so I opted for some Baccus 6mm. The small blisters are two extra packs of infantry, one of dragoons and one of artillery. That will give me 16 infantry regiments, 6 cuirassier, 8 dragoon, 3 hussar and 6 artillery batteries. I'm going to do them as "imaginations". From Warbases I got various bases for figures and terrain. Also some small bases and dice frames. I managed to restrain myself at Bad Squiddo Games and left with just the new WW2 Soviet women packs (the deal for these three packs was £30 instead of £34 to buy the packs separately) and didn't buy any of the "gunny peegs" despite serious temptation. Some reinforcements from Essex for my SYW Russians: figures for two combined grenadier regiments and another dragoon regiment - I discovered that I'd somehow missed the Nizhegorodskiy regiment which fought at Palzig and Gross-Jagersdorf. I picked up my pre-order from Eureka. I'd ordered some Grumpy's Korean artillery (I need to crew figures for medium and heavy guns), some Eureka 18mm SYW command groups (which I'll be painting as gifts for the other contenders in the side duel during the Challenge) and some sample figures to see how they fit with the Essex. The Cossack looks OK, but the infantry are noticeably larger. I also cooed over the "Mad Maximillian" cars, but then I saw the prices and decided against buying them. From Timecast I picked up some 6mm black powder era buildings for SYW gaming and some 10mm North African houses to represent a village with my desert terrain. Last of all is my pre-order from Foundry - a few groups of their 2000AD figures to make crews for Rogue Stars. I didn't take a pic, but I picked up the new issue of Wargames Illustrated and foresook the 5p change so that I could get their Richard III figure. And I've almost finished the terrain pieces. Just the plateau, river and road pieces to go. And adding tufts and scrub to various pieces. And crops and palms to the fields and plantations. I might also go back and tint various rocks to add some variety. This afternoon I've been making tufts to add to them. I started off doing 2mm tufts on some A6 pieces of two potential backing materials - the backing sheets from adhesive flexometal that I use to line boxes for troop storage and glossy photo paper (12 x A4 sheets from the pound shop). Then I did some mixed 2mm/4mm tufts on the foil backed parchment that I've been using. The next test for the two trial pieces is how easily the tufts will come off - that will need to wait until tomorrow to give the tacky glue time to cure. However, like I saw previously with OHP film and plastic from punched-pockets, the flexometal backing appeared to develop a static charge on the surface which meant lots of the static grass loosely adhered even where there was no glue. Tomorrow afternoon (and into the evening), I'll be at the club for a big game of King of the Battlefield - all those Russians I painted up during the Challenge will get their first blooding! Usually there are multiple blog posts about this, but the only one I've seen so far is the original from Ray. So, I guess with it being just one week away that I should post a reminder. So, I hope to see some of you next Saturday. I took Tuesday evening off (it was my birthday, so that's allowed!) and only did a little bit last night - basecoating over the grit/sand. Today I carried on, first with a wash. I realised after doing the first two pieces that the mix was too dark so I watered it down for the remaining six. I then dry-brushed them with the basecoat and then two lighter shades. However the first two pieces were still too dark so I went back over them with the basecoat. I've still got to add tufts and little bits of brush but that will have to wait until I've got all the other pieces done. Tomorrow I'll be doing the basecoat, wash and drybrushing on those. I will also be sanding down the filler on a few other pieces - if I have time I'll add grit and sand to those as well. Tomorrow night I'll be sealing the grit and sand with diluted PVA, then will paint them on Wednesday night. I'll be adding grit/sand to the dunes and fields/plantations as well. Today saw some more messy fun coating terrain pieces with filler and I have got most of them done now - just the fields/plantations, the steep hill and the plateau still to do. I got the dunes coated this morning, then added Das clay over the bamboo skewers on the river pieces to create banks. I also did a couple of test pieces on the road sections - one with Das over the skewers, one with filler over the skewers and a scrap piece with just filler. spread over the surface. When the filler had dried on the last one I spread PVA over the filler and added sand to see if that would cause warping - it didn't. This evening I got all the river and road sections covered with filler. Looking at the road sections, I think I might have been OK to forget the skewers and just coat them with filler - I might cut some more strips and do that. The ones I've done so far can always be used as narrow rivers for other gaming. At one point while the filler was drying, I decided to strip down a couple of the topiary ball halves. You don't half get a lot of pieces - I got 180 off the leafy one and 200 off the grassy one. And that's just from half a ball! I think tomorrow night I'll be adding filler around the edges of the field/plantation bases and make a start adding sand to the hills, gully and dunes.